On the 1st October the people of Catalonia went to the polls in a referendum on independence from Spain. The right-wing nationalist government of Spanish prime minister Mariano Rajoy did its best to prevent the referendum from taking place. The government had Spanish courts judge the referendum’s legality under the Spanish constitution, and they ruled the referendum to be illegal. Legal action was also taken against elected officials and members of the Catalan parliament. Associated websites were closed. And prior to polling day, police were deployed in raids to shut down the printer of the ballot papers, seize ballot boxes and close down polling stations. On the day the Spanish gendarmes were deployed to prevent the vote from taking place. It was an extreme and brutal exercise in policing that resulted in nearly 900 civilians being injured. And 39 policemen were also injured in the fighting that broke out. Bricks and bottles were thrown. Yet it will be the scenes of the young and elderly being physically dragged away by police that will shape global opinion, and the action was rightly widely condemned. The response was out of all proportions to the offence. The parallels to events in Hong Kong three years ago were not lost on many here. The Catalan referendum lacked both official and legal authority, as did the 2014 poll in support of genuine democratic political reform organised by the protest group Occupy Central with Love and Peace. Both were opposed by the authorities and their online set-up sabotaged. Yet both eventually drew unexpectedly large turnouts, 800,000 people in the case of the Hong Kong poll. Both the Catalan and the 2014 poll and later protests were not a result of an outburst of political extremism. Both were a result of years of official silence to what were very reasonable demands for dialogue — a culmination of a complete breakdown in communication between the state and the people. Despite having set 2017 as a date for introducing universal suffrage, both Beijing and successive HKSAR administrations had refused to entertain any of Hong Kong’s democratic voices. This closed door policy lead to the concept of civil disobedience being considered as a means of drawing the government into dialogue. Like in the Catalan case, confrontation was never the aim, with previous polls suggesting the majority of Catalans were in favour of more federalist system. What as desired in both cases was not separation but less interference. The quest for independence has always been tough for the Catalan people, and today, it is the moment that they determine their own fate. If the bill is passed in the referendum, Catalonia will declare independence within 48 hours. A marriage 500 years ago merged two reigns with disparate backgrounds together, paving the way to the independence movement today. This is not factually nor practically correct. The Catalan parliament does not have the authority under the current Spanish constitution to declare independence. However, this is not to say that the people themselves do not have the right to do so, and to identify with a Catalan nation separate from Spain. Many already do. What is actually at play is a far more complex political game in both the Catalan and national parliaments between various political parties, each with their own agendas. Why do Catalonians want independence? Cultural suppression. (2) Renaixenca (Catalonia first) needed for a stronger economy and just political system. (3) Suppression by the Spanish Government (calls for independence, threat to local language and trials of activists). (4) A continuous fight – the Spanish government is trying to influence the movement for independence by re-enforcing a Spanish identity through education and religion. 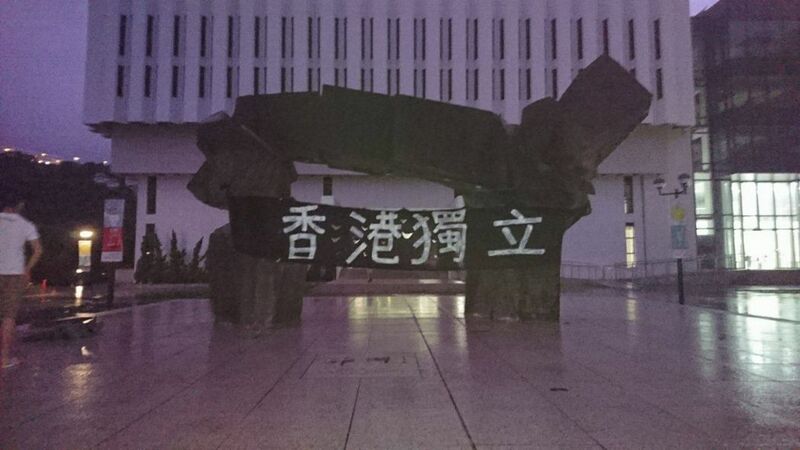 It is revealing that a once traditional, cautious and conservative student body at Hong Kong’s premier university has today adopted an activist perspective, and are behind posters so passionate in tone. Also revealing is that it is culture and identity above economics or social issues that are stressed. In this I believe the students are right, as attested in both interviews I have seen and in discussion with Catalan friends. This is also true with Hong Kong. The principle issue underlining local political dissent is not economic nor is it social, as the government and pro-establishment insist, but that of respect and dignity. Economic and social factors may indeed play an important role in creating an environment of distress, but they do not underpin the strong and often strident views of those who in some incidents have begun to contemplate separation. This issue of dignity and respect is critical as it is that which is most keenly felt. When the state denies one’s identity — when culture is not recognised, our institutions and values corrupted, and our language discouraged, and our mothers no longer determine what we may call our mother tongue — this motivates a survival instinct with each of us to fight back. The Hong Kong dream may be over for many, but Hong Kong people know they will not go hungry and that their social and economic problems are very much those of the first world: housing, inflation and growing inequality. What is felt deeply, in both Catalans and Hong Kong people, is that their identity is not being recognised, which constitutes a fundamental challenge to who they believe they are and who they want to be; a denial of our most basic right, and a denial of human dignity. Yet while parallels may be drawn, the situation in Hong Kong remains fundamentally different. It is also, sadly, far less hopeful. He is, of course, being pragmatic rather than a hypocrite. In principle he supports the right of people to decide their own identity and political representation, whether it be as part of a wider nation or as a nation on their own. The extent to which our recognisable relationships extend is and should be a personal decision. However, he feels the need to compromise his principles — to compromise what he knows to be right; while he does not feel threatened by Spain, he does fear China. Sadly my friend is far from alone. People I know, even those who are pro-establishment, may respect China and feel pride in the country’s recent achievements, but their relationship is also one of fear. Patriotism, the love of one’s country, may be the last refuge of the scoundrel, but is also a love dictated by fear. Several people I know have removed posts on social media in support of voices calling for genuine democratic reform, because they genuinely feel threatened. Employees have been told by their employers, and even lawyers told by partners, that any sign of non-establishment views may result in transfers, lock of promotion or even loss of jobs. This threat exists not just within private business, but also and more worryingly within core institutions. A lawyer working at the Hong Kong Stock Exchange who had been active in supporting the Umbrella Movement was required to remove posts on her personal social media account reflecting her political position. The threat has become systematic of doing business with the Mainland and for maintaining guanxi with our own government. Even last month on the campus of The Chinese University of Hong Kong, I spoke with students and parents who were afraid to speak their mind despite feeling strongly in principle that it was wrong to prevent independence from being discussed. For every supposedly “foreign influenced” academic manipulating students, there are a hundred who do their best to stay on the right side of government politics by at best being politically apathetic, and who also do their best to keep their students out of politics too. This compromise of principle, the “pragmatic approach” so favoured by some, is again driven by fear. The fear that compels so many people in Hong Kong to hold on to foreign passports, and for so many of our countrymen to send their families and keep their assets abroad. Yet the compromise inherent in pragmatism is driven by a desire for progress. When our choice is driven by fear it is oppression. The ugly scenes of Spanish nationalists reacting to the referendum with chants or “One People” and “One Spain” is sadly little in comparison to the condemnation we hear from our comrades and countrymen. We know how it feels to be told we need to be “put in our place” and that if we do not subscribe to a political identify we are to be denied an identity at all. We also know such condemnation will not highlight the bonds between us but only stress our differences; and that it is this that widens divisions and fuels the flames of extremism. There is also the line that dissent is illegal and the work of “foreign actors”. This is the line that all nationalists governments take because, in search of a national project they no longer listen to nor respect their people. This is the language, as the Spanish writer José Ortega y Gasset observed, of a country lacking backbone. For him the Spanish people existed as separate and individual vertebrae, bending and breaking with no connecting tissue between them. It is a view of the Iberian peninsula, united by religious tradition and crowns, that will ring familiar with historians of China. 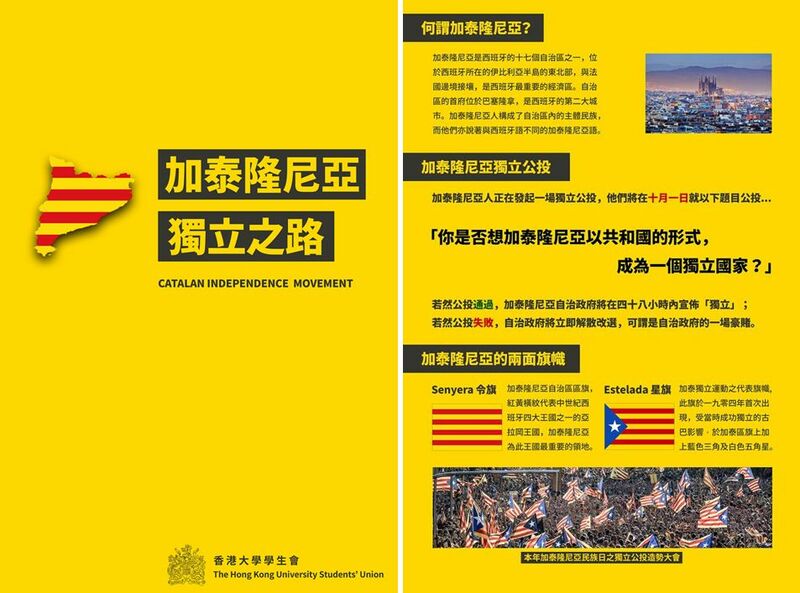 The critical difference between Catalonia and Hong Kong is in the relationship each people have with their receptive nation states. The Catalans may have a referendum, yet in Hong Kong we must conduct a poll. Not only in concept but also in word, referendum is inconceivable under the Chinese Communist Party. Catalans, regardless of their political views, can call for both prime ministers of their regional and national parliaments to step down and that there be snap-elections. They can vote for whom they want as representatives in Barcelona, Madrid and even at the European parliament. And more fundamentally, their representatives are free to speak their mind. They may be critical of their national government, national policy, even of their prime minister. Thus Catalonia is already much more than a special administrative region. The Catalan parliament is fully and democratically elected, and has powers to ensure not only the preservation but the active encouragement of its own culture, language and identity. It controls its future, setting its own curriculum and history, controlling the education of its own people. In Hong Kong it is not only that such powers do not exist, but that the thought of them cannot be conceived within the framework of our national body. Separatism is not just the choice of an idealistic minority, but the only conceivable avenue through which the status quo be changed and Hong Kong’s identity be preserved. I write this as someone who does not believe that separatism is either realistically achievable nor helpful in the current political environment — and yet I must acknowledge that for there to be positive change for Hong Kong, it is up to our government both here and in Beijing to show us that they are willing to engage and prepared to, if necessary, to change. Most of all Catalans can within the framework of Spain still speak openly of independence. They can wave the flag of their fathers. Freedom of conscience is respected. In Hong Kong, for those of us who dare question the official line, very real threats exists. In Hong Kong choice is no longer free.